Asrai.org • View topic - The wardens of the Wild Heath. Update February 3rd. The wardens of the Wild Heath. Update February 3rd. Dude! Loving the whole thing! Can't believe you think the wardancers look messy close up! They're awesome! Living the kitchen sponge flowers will be "borrowing" that idea. Also I agree with you on orion and think you've managed to make him look animated. The owl is simply a credit to you. stunning work and inspiring! sooo cool!! thank you for making these pictures available! lol . do you have a youtube channel? No i dont have any you tube channel sorry. Thank you for the compliments. 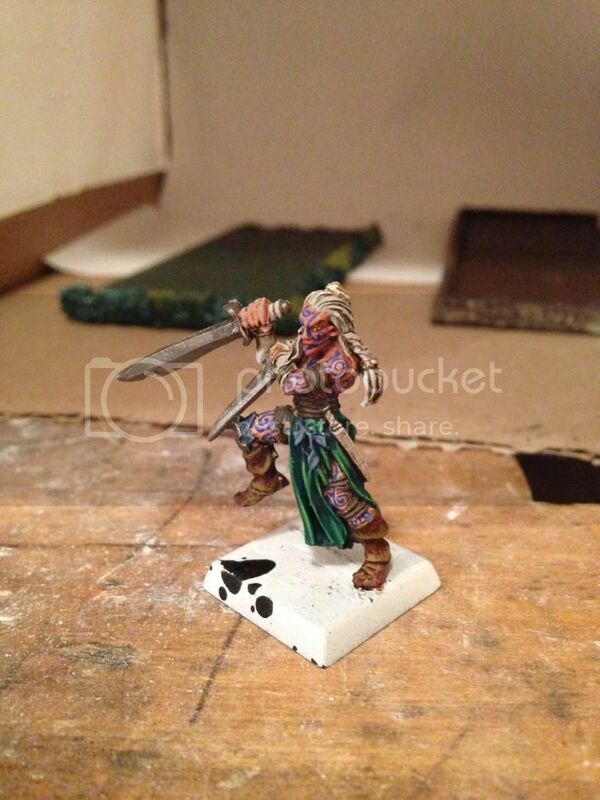 Its been a while since i have done any wood elves now. Longing for a new book to know what new to add. Only new thing i have for the army now is my wildriders who have gotten new wolf mounts. (40k fenrisians). this reminds me i need to update this plog with those additions. May I ask what colours you're using on... Well everything? Greens are orchide shade mixed with skull white upto the final highlight. About 5 or 6 layers, the a watered down thraka green wash.
Browns are schorched brown highlighted with graveyard earth. For the leather parts or layered with mixing in red and orange upto yellow with Devlan mud was for the "mahogni" hardened wood. Only got like 20 pieces done atm. I guess after 10 years ill be able to paint as well Great job mate ! I love the Dragon & the owl! Long live the King in the Woods!!! FINALLY!!!! 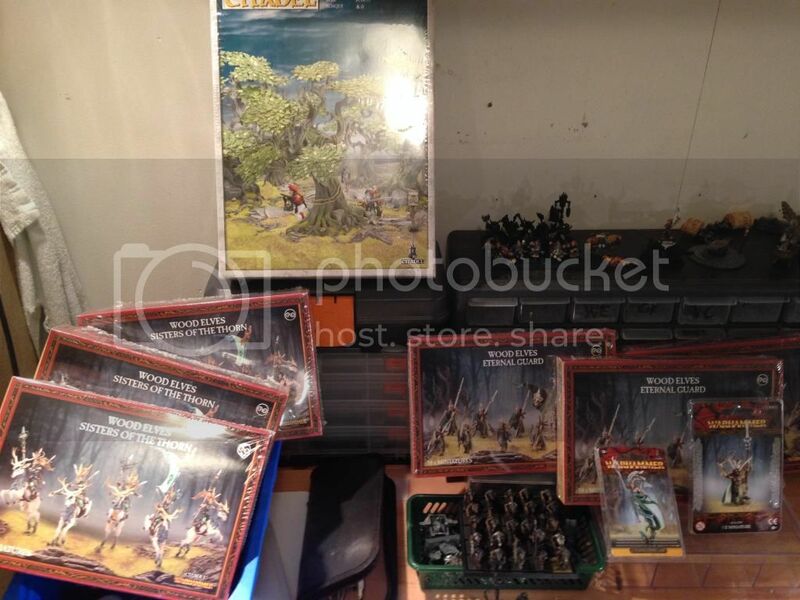 I have new wood elf models!!!! Re: The wardens of the Wild Heath. update may 2014. Revival! I haven't got many things painted since the release of the new book, but that's because all my hobbytime has gone into building stuff. I am so jealous of your warhawk riders. Yeah they came out pretty good. Not my idea though "
Great banner on the Sisters. So far it's just a basecoat, 2 layers of drybrush and various washes. So there is still some work to do. The wardens of the Wild Heath. update sept 20th! This is what i decided to start on tonight. A conversion of a mounted spellweaver. Edit: pictures removed. See finished model below. Last edited by Baardah on 04 Oct 2014, 08:09, edited 2 times in total. super jealous so beautiful. I need to get back into painting. Re: The wardens of the Wild Heath. update sept 20th! I have to thank you now mr. Baardah because you've just solved my problem. I didn't know what to do with sisters, and I didn't want to buy new box(es) of riders/sisters and waste money. I was trying to mount them (sisters) on horses but it looked plain. Now, if you don't mind, I'll put some cloth on like you did. That will solve my problem with plainness. Great conversion, I like it a lot!